T.B. Joshua on Food Scarcity – “You have not seen anything yet"
On Sunday May 22, 2016, T.B. 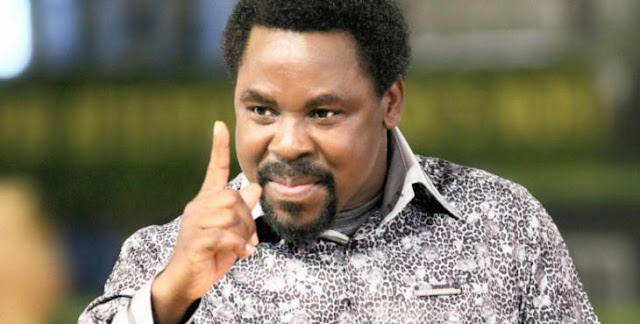 Joshua of the Synagogue Church Of All Nations (SCOAN), made some shocking revelations on his Emmanuel TV station concerning Nigeria and the world at large. The ‘prophet’ spoke on many issues including the recent EgyptAir crash, African politics and agriculture, even warning of a terrorist attack in the United Kingdom. He read out a transcript of the prophecies he had given during his New Year’s Crossover Service, highlighting particularly the national food scarcity. On each point read, he expanded further, detailing what Nigeria and Africa are to expect in the nearest future. In the last few days, Nigerians have woken up to the stark reality of the rising food scarcity. Several reports were released on Monday, Tuesday and Wednesday detailing the extent of the current national food woes. Tomato ebola, violence from fulani herdsmen, missed harvests and rising transportation costs have all been attributed as the cause of the food shortage and spiralling food prices. The day following Joshua's warning, 27 schools had to close nationwide in the UK due to a bomb scare. Apparently, anonymous repeated calls were made to each school, warning of explosive devices. The callers told the receptionists that "if the school called the police the bomb would be detonated immediately". The threats continued on Tuesday with more schools being evacuated. On the Egypt Air crash, Joshua said: “Egypt has happened and the other one I am seeing is very close and I am going to say the country and the place. This one that I am seeing now is bigger than the one that happened. This one is very close now. The cleric dishes out national and international predictions on a regular basis, using the platform of his Sunday services, broadcast live on his Emmanuel TV. While some embrace his prophecies, upholding him as an end-time prophet, others are highly sceptical. Despite mixed reactions to his prophecies and purported miracles, Joshua has a huge following worldwide, with his YouTube Channel having over 350,000 subscribers and 2.2million following him on Facebook.